I was heartbroken as I recently watched “Spotlight,” the movie that received this year’s Oscar for Best Picture. It chronicles the events that resulted in a series of articles by The Boston Globe’s investigative reporting team exposing decades of abuse of minors by 90 priests serving in the Archdiocese of Boston. For anyone who loves the church and her priests, the film is painful to watch. However, that pain is miniscule compared to the suffering of the innocent young people and their families who were victims of the abuse. There are legitimately debatable aspects of the film. “Spotlight” reports that as many as 6 percent of priests serving in Boston were involved with abuse of minors. However, when you compare the number of abusers to the priests serving in the archdiocese over the entire time period of the abuse, the percentage is actually lower. “Spotlight” suggests that celibacy is to blame for the abuse, but none of the data with which I am familiar supports that assertion. “Spotlight” claims that the abuse was not related to homosexuality, even though the vast majority of victims were male. However, these issues pale in comparison to the accuracy of the overall storyline that recounts hundreds of indisputable occurrences of clerical sexual abuse, as well as the failure of church authorities (bishops) to protect young people and to prevent perpetrators from having the opportunity to abuse again. One instance of the abuse of a young person by a priest is one too many. Every instance of abuse of children and youth is a tremendous tragedy. As part of our observance of the jubilee Year of Mercy, the archdiocese is sponsoring three Healing Prayer Services. The first will take place at 7 p.m. next Tuesday, April 12, at Good Shepherd Church at 12800 W. 75th St., in Shawnee. The purpose of the Healing Services is to invite Catholics throughout the archdiocese to pray for the healing of all victims of abuse and, in particular, for those victimized by representatives of the church. I invite every member of the archdiocese to attend and join me as we pray for healing for those who have suffered because of the misconduct of a priest or another representative of the church. Your presence and participation in the Healing Service will be a manifestation of your concern, compassion and solidarity with abuse victims. I extend a special invitation to victims and their families to participate in these Healing Services. I hope the Lord will use these times of prayer to be a source of grace and healing for all those wounded by the church. The sexual abuse of minors is a huge societal problem. While the vast majority of perpetrators are not priests, when the perpetrator is a priest or a representative of the church, there is an additional insidious ramification. Those abused by priests or other representatives of the church often find it more difficult to go to the one place they should be able to come for help and healing. Priests serve as the human instruments through which Our Lord makes himself present sacramentally in the world. As such, priests represent God to their parishioners. Thus, those sexually abused by clergy often feel abandoned and even betrayed by God. Frequently, this leaves victims alienated from both the church and God. The film “Spotlight” does not address the response of the church in the months and years after the revelations of The Boston Globe investigation. This is a story that also needs to be told. Within a year, “The Charter for the Protection of Children and Young People” was adopted by the United States Conference of Catholic Bishops. As a result, every diocese is required to have an Independent Review Board, composed of individuals with law enforcement expertise, professionals who provide care to victims, parents, etc. Upon receiving a credible allegation of the abuse of a minor, dioceses are obligated within in a short time to notify the chairperson of the Independent Review Board. Credible abuse is defined as an allegation that cannot be disproved by the simple facts of the case. The chairperson is to convene the Review Board as soon as possible to examine the allegation and make recommendations to the bishop. The bishop is obligated to consider carefully the analysis and the recommendations of the Independent Review Board. Moreover, every staff member and volunteer who interacts with children and youth must undergo a background check and participate in a safe environment program. These safe environment programs are designed to heighten the awareness of the signs of abuse, as well as to create a culture of best practices to prevent the possibilities for abuse to occur. Every diocese undergoes regular independent audits to measure compliance with the charter. As a result, I believe that today our churches and schools are the safest places for children and youth. I am committed to making certain that they remain so. 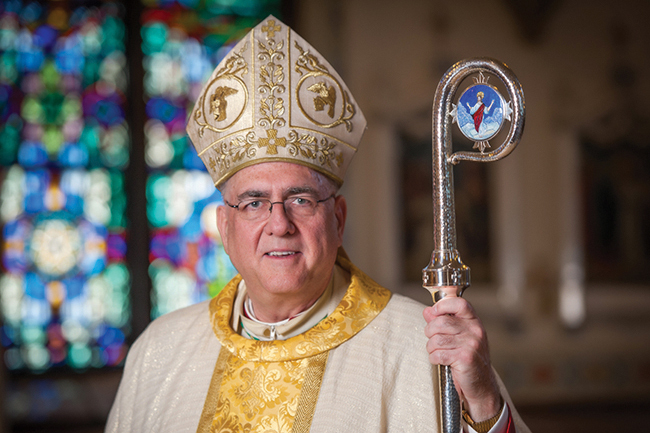 As a bishop, I apologize for past failures to protect adequately all parishioners, especially children and youth. I intend to watch “Spotlight” annually as a reminder of my responsibility to be vigilant in the protection of children and youth. Please come and join me at Good Shepherd Church on April 12 to pray for healing for all victims of sexual abuse. May the Father of Mercies heal the wounds inflicted on these innocent hearts!